The Dragon is the larger powerbase built by DragonMobility. By angling the elevator mast the Dragon can be made suitable for a 50kgs (8 stone or 112lbs) rider when in the upright position through to 75kgs (12 stone or 168lbs) when fully raked back. 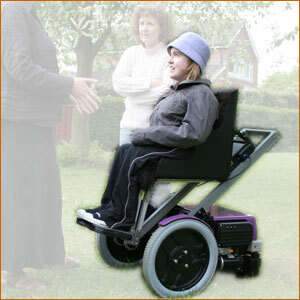 Each powerchair is programmed for the individual user. If you would like to learn more about Dragon visit the features page. For more detail see the Dragon technical specifications for upright or raked. As much as we can write there might be a question we have not answered on these pages - so do get in touch with us; phone or e-mail, whichever is more convenient for you. We would love to hear from you. Also reading about something is not the same as actually trying it. We will happily arrange for a demonstration at your home, school, work - whatever is convenient for you - just give us a ring.